First up, I got my hair cut! I have been in a cutting mode lately. Since Trey was born I have cut 9 inches off! 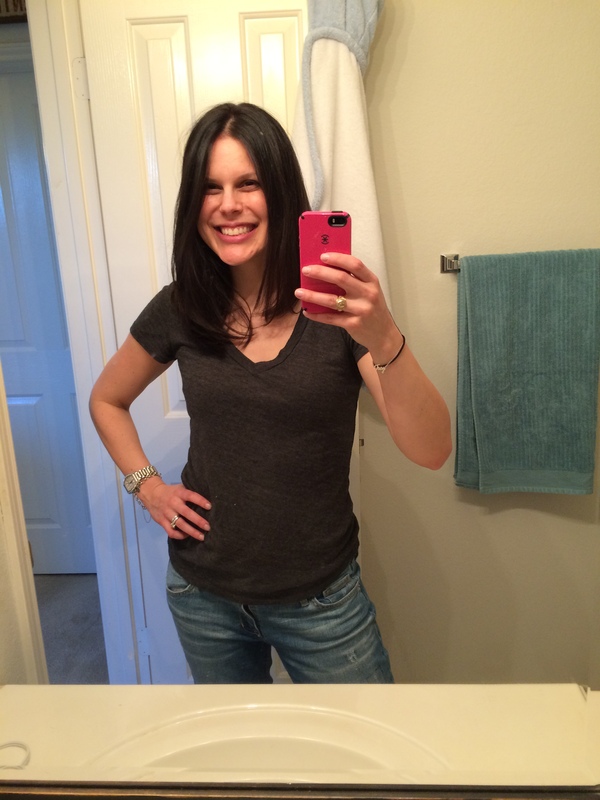 I got 5 inches cut off the day I went into labor (good timing!) and then I cut another 4 inches last week. I like my hair long but it is just too hot in the Texas summer for long hair AND Trey is quite the hair puller. I also got it colored. I finally caved. Standing in front of the mirror each night plucking out my gray hairs with eyebrow tweezers was just getting old. Ha! When did I get old enough to have gray hair?! 😦 But I asked my hair lady to match my color the best she could because I am a low maintenance hair girl and the idea of a major upkeep job was just not for me. Another awesome big Trey moment is he is really starting to like both his carseat and stroller. What?! I was convinced my kid was never going to like either but this past week we turned a corner and he actually seemed to like both! Fingers crossed! I was so confident in his newfound carseat skills that I actually took him grocery shopping! For those of you who know me in real life you know this a huge deal for me. I am ALWAYS so scared of being that mom who has a screaming child in public (I know I need to get over that and I’m trying) but Trey did great! I stuck him in the basket still strapped in the car seat and he was in awe. Just looking around and taking it all in. This made for a happy mama! 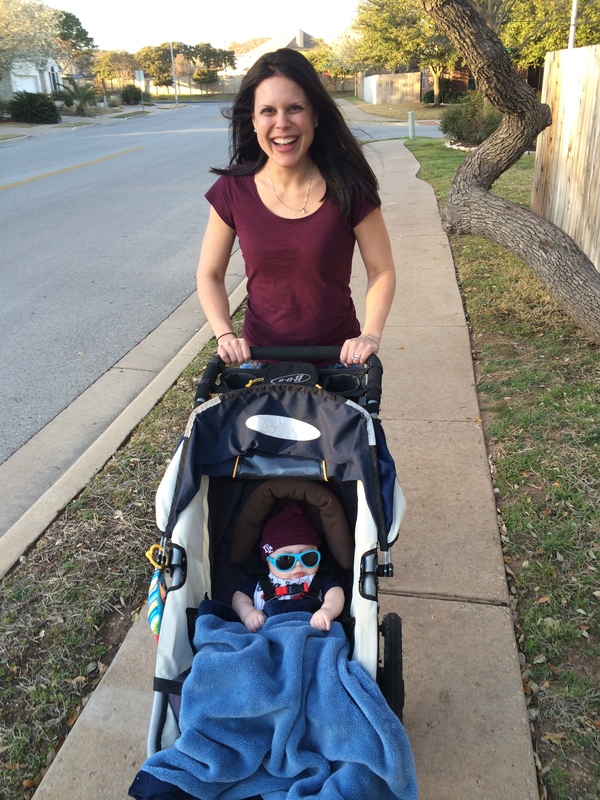 We celebrated that night by taking an evening stroller ride in which he seemed to also enjoy! A very special moment for my family over Spring Break was taking Trey to meet our fertility specialist, Dr. Silverberg. 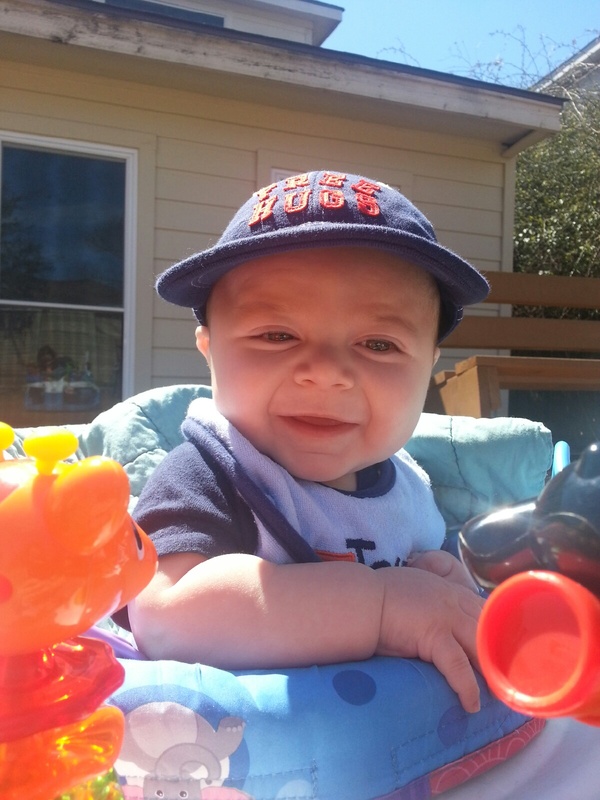 (For those of you in the Austin area he is affiliated with Texas Fertility Center and he is amazing! He is the kindest doctor with an incredible bedside manner). 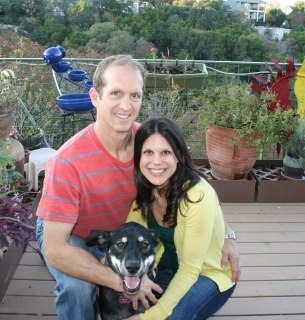 Without the help of Dr. Silverberg Trey wouldn’t be here with us. I was so happy we got a chance to go back and visit. It was very emotional for me and I still can’t look at the picture below without tearing up a little. For those interested in our pregnancy journey you can read it here. Trey also went on his first play date to meet new friend Isaac! I didn’t snap any pictures (dang it) but it was fun. Isaac is about 6 weeks younger than Trey and I hope they have many more play dates in their future. Of course it didn’t hurt that mommy got to see her friend Sarah! 🙂 I think at this stage connecting with other new moms that have children around the same age as Trey is huge! It makes you feel not so crazy when you realize other people know exactly what you are experiencing/feeling. Keith and I were feeling so good about Trey’s good public behavior that we decided on Saturday to take him out to eat. GAH!! I was nervous but excited. The freedom to know that I could take Trey to the grocery store and out to eat was almost too good to be true. I was game to try. Plus I know that the only way that Trey and I are going to be comfortable in public is by going out into the world more. And with summer coming up, I plan to do just that! So we loaded up and out to eat we went for lunch on Saturday afternoon. Trey was SUPER! He stayed in his car seat through the meal and then I pulled him into my lap towards the end while Keith finished his food. The rest of the week was spent just hanging out and playing. I made a bunch of Pinterest recipes I pinned and just relaxed with my little man. I took lots of pictures and as evidenced by Trey’s face below he was probably like enough of the camera mom! What can I say I’m a little in love with my guy. I have taken 813 pictures of him (according to my iPhone) since he was born. We also spent a lot of time outside. Trey is an outside boy and that’s fine with mommy and daddy. We love being outside so it’s good to know our child follows suit. 🙂 Such a big boy! And that was Spring Break. Fun, fun and more fun! A taste of summer…although I wish the weather would stay the same. I am so not looking forward to the 100+ degree heat we will have for months on end. Ugh. Just thinking about it makes me cringe. Do you still get a Spring Break? 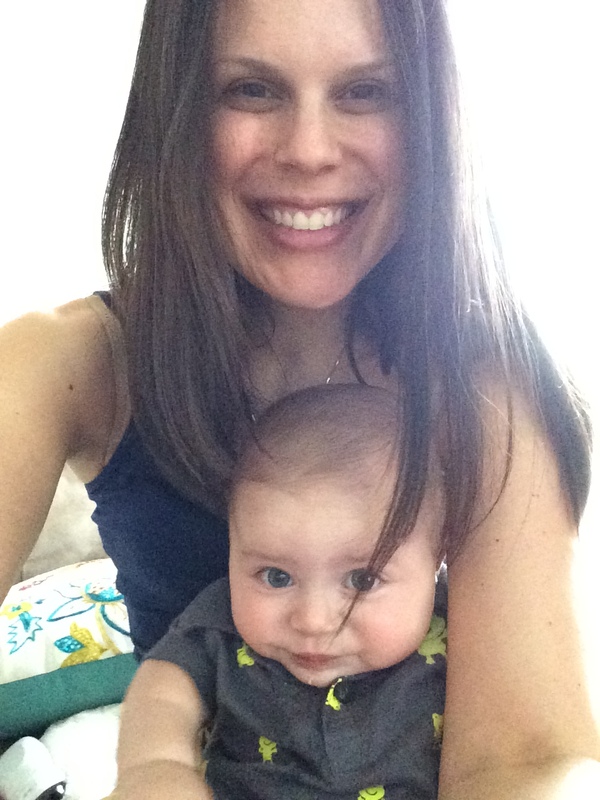 Yes to meeting other moms with babies around the same age! I have a neighbor who has a 6 week old and we’ve been hanging out with the babies all the time. Glad Trey is liking his car seat/stroller more. Me too! Being able to go around the neighborhood and drive without him screaming is like a whole new world. Ha! So glad you had a good time 🙂 about baby screaming in public…just depends on what the scream is about. Clearly, if its hunger or something you can solve, you just do that as quickly as possible. There have been times I have taken the baby to wait in the car while hubs picks up the check or finishes shopping. And thats okay. I dont like being the person in public with a screaming baby either, but the more you take them out the more they get used to doing it. Nicholas could shop for hours upon hours even at 3 and 4 when he was walking around. I didn’t have the chance to take Jax out as much and he HATES to shop. WIth Anthony I hope to find a good balance. At the end of the day, just don’t worry about him screaming and always have things on hand to help entertain him. A special toy he only sees when out and about might help too. Did you get the mesh food thing? It will save so much heartache. Not only is it great for teething (stick some frozen fruit in there) but it keeps baby occupied. I used it a lot once my kids were sitting at the table with us both home and out. I HATE being the mom with the screaming child. Luckily Allston is really great during the daytime and most of his fussiness comes in the evening hours. I was petrified to fly to NY solo with him. 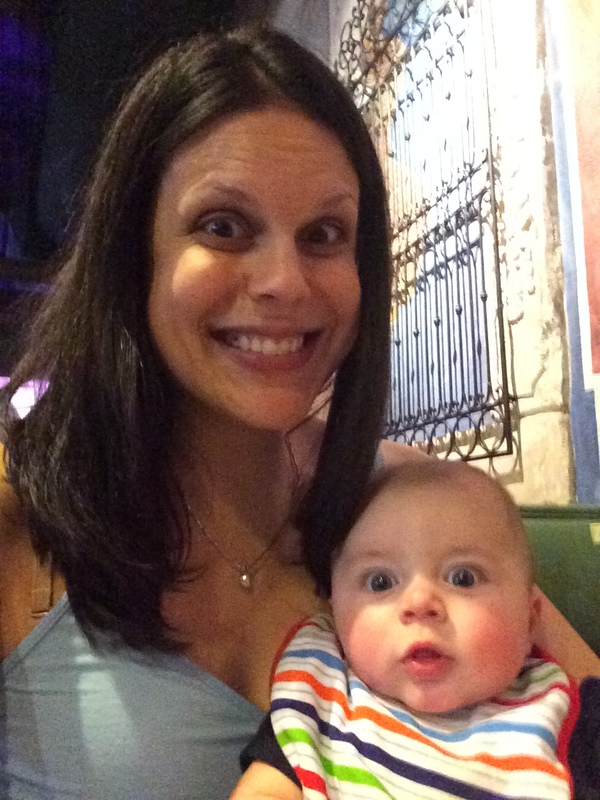 It’s bad enough being in a restaurant with a screaming baby, let alone an enclosed air plane, but he did awesome and I felt bad for not giving him more credit! I’m bummed Spring Break is over! I wish we had more time off when the weather is good instead of the 2 hottest months off. Oh well. song – it was a new world of freedom for us. You will have the meltdowns (everyone does) but each successful trip builds your confidence and gets you used to it. Good work mama! !